proDAD Mercalli V4* makes it quick and easy to fix shaky and distorted footage. A few clicks is all it takes to analyze and stabilize video clips and recover one-of-a-kind takes — with no visible loss in quality! Capturing amazing high-speed moments is difficult without the aid of expensive equipment. 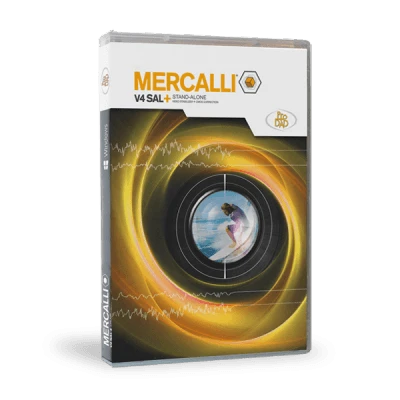 But with proDAD Mercalli V4* you can turn even the shakiest footage into a perfectly stable movie. For any terrain. For any type of distortion. For any footage. Specially designed for all Movie Edit Pro products and Video Pro X, proDAD Mercalli V4* is your go-to tool when it comes to recovering precious footage. Whether your camera has picked up motor vibrations from a car ride, or uneven terrain is to blame for your shaky footage, Mercalli V4* can detect the full spectrum of image distortions — even when they show up together. Simply have proDAD Mercalli V4 analyze the section of video in question, select the settings you want to use and get ready to be amazed by the results. Whether with normal stabilization, rolling shutter or CMOS correction, Mercalli V4* can optimize footage from any action cam, any smartphone and any camcorder — better and faster than ever before. For one-of-a-kind shots, the way they were meant to be. The period of use of this software is limited to 24 months. Some advanced program features demand more of your computer's processing power. To get the most out of these features, your system should at least meet the recommended requirements. The specs for your computer can be found in the control panel of your operating system.